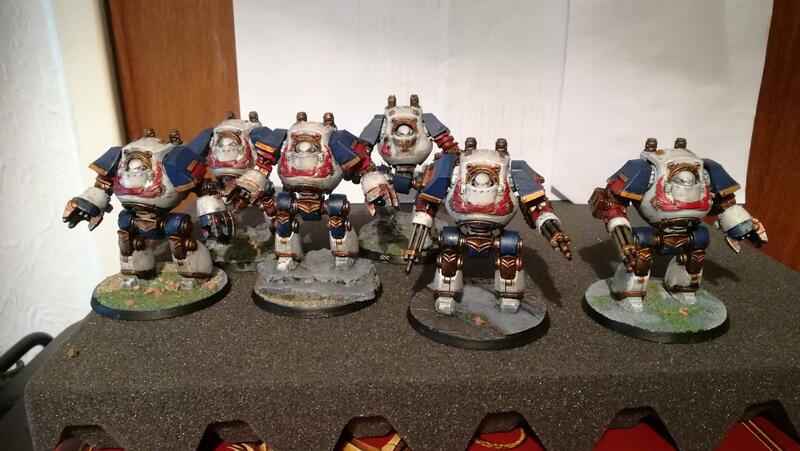 This is our new regular monthly feature with our hobby progress thus far, so lets see what we have been up to this month. He never seems to find the time to hobby does poor Chris, but this month he has been continuing to work on his Telemon Dreadnought, slowly getting the base the right shape and size. Continuing his work on the World Eaters dreadnoughts, I think he is going to be able to field an army of them at this rate. Michael has been a very busy boy this month, he started off by painting a few things for his Word Bearers to prepare them for the London Heresy, five Heavy Support Marines to top up a Volkite Culverin Squad to a ten man unit, and a Cataphractii Praetor, he also did the MKIII Praetor whilst he was at it. He then added a few men to the Ultramarines, two five men groups to top existing squads up to ten men units, some Destroyers with Jump Packs and Lascannon Heavy Support Marines, and then he painted a squad of Recon Marines with Shotguns. He has also painted up some Thermic Plasma Conduits for Company of Legends, because we always need more scenery and terrain for it!